How in this Mother’s Day week could I not mention the mother of my husband – the woman who raised him and his siblings and taught them to be the good, kind and strong people that they are. My mother-in-law has an ultra-adventurous spirit and unlike me, who has called the same city home for most of my life, she has followed her urges to shake things up and change – if not cities and provinces, at least houses. Yesterday I spoke of the gardening gene passed from soul to soul from my grandmother. My husband’s mom is a brilliant artist and this talent has come to life in my daughter and even my small granddaughters. From the three-year-old to the eighty-year-old you can’t hold them back from their creativity, bent over their canvases all of them can fill an afternoon creating vibrant and wildly imaginative masterpieces, comfortable to focus completely on their muse. Answer in the comments section. The person with the most correct answers this week will receive a signed copy of Text Me, Love Mom, Two Girls, Two Boys, One Empty Nest – available from Amazon and other online book sellers. This blog is dedicated to my mom, aka Gramma or GG. In her honour it’s high time for some fun, some merriment, some exuberance even. My wonderful 86-year-old Mom just settled back into her home after 4 weeks of rehabilitation from knee replacement surgery. Along with all sorts of health care professionals my four siblings, my daughters, and I have been mothering the mother, and even more than that we’ve had all hands on deck taking care of our dad (Grandpa) whose whole world was rocked not having Mom in the house they still abide in. 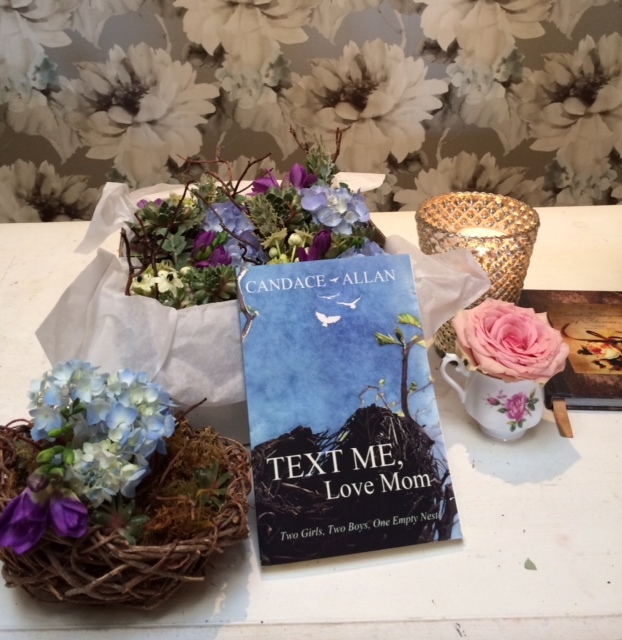 But hey, it’s the first week of May – Mother’s Day approaches and I’ve decided to have some fun with my book Text Me, Love Mom in celebration of Mama’s everywhere. Text Me, Love Mom; Two Girls, Two Boys, One Empty Nest is about that time in a family when the kids are leaving home and the folks are striking a new balance with them. But kids do come back, like my fifty-something siblings and I are doing, and the mom is always and forever the mom. So let’s have some fun …. And this one’s for GG, an avid gardener- Anyone know what type of pink blossoms Text Me, Love Mom is nestled up against in this photo? You can answer both questions in the comments section. Happy Mother’s Day Week! !